Digging comes quite naturally to your dog. His ancestors still dig to create dens or to escape cold or hot temperatures. Your dog may also dig to hide his valuable things, including bones, toys or food. 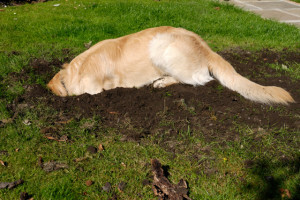 Digging is often difficult to stop, but rather than trying to stop all digging, you can give your dog one place where it is OK to dig – a dog dig pit. Find a place somewhere in your yard where your dog could dig. Use bricks or wood to outline the area, so he knows that is the one place he can dig, says the ASPCA. Fill this area with sand or loose dirt. A dog dig pit isn’t worth the time it took to build, if your dog won’t use it. To encourage your dog, bury toys, bones or treats just under the surface level of the sand or dirt. Then bring him over, show him the treats and praise him when he starts to dig in his new area. After your dog gets the hang of it, you can bury treats or bones deeper. Keeping your dog interested in his dig pit will be easier if you replenish his hidden treasures. You can even dig beside your dog, if that’s what it takes to explain the purpose of the pit. If your dog still burrows or digs in other areas, bring his attention back to his sand box, and reward him when he digs there. Act excited when you bring him over to the designated area. Be sure you have included a border that clearly marks off this area as being just for your dog. It’s helpful to add sand in your dig pit, if you are just starting one out with the dirt that was already there. This makes it easier to clean Fido up after he has been outside digging after a rainstorm. If he needs a more thorough cleaning, you can take him to A Stay in the Country Pet Lodge, for a good grooming. You can use words that the dog already knows, like “Get it!” and praise him when he gets in his dig pit. If you catch him digging anywhere else in the yard, redirect him back to his own area. If you see him in his pit, even if he isn’t digging, praise him. Continue to bury things he likes in his pit so he will always have a reason to dig there, rather than elsewhere in your yard.